Polished General Insignia is in the shape of star. It is plated with 22k gold. So it is valuable when compared to other insignias. The product pack has two insignias with pin closure. People who are in the officer’s grade in the US Army are awarded this insignia according to their ranking. The pin closure makes it easy to pin on coats, shirts, pants, sweaters, bags and shoes. 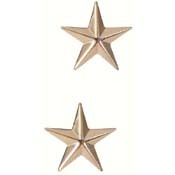 While ordering for insignia online, check for a reliable website that deals with Army badges for quite some time. The stars in new polished and sheen golden color are brilliant. When pinned on to coats or shirts, no doubt it adds to the individual’s personality.